MSU and WJR collaboration Greening of the Great Lakes featured MPress author Sally Barber discussing her newest book The Michigan Eco-Traveler. Greening of the Great Lakes, a website and talk radio program, focuses on all types of sustainability, be it economic, social, or environmental. The talk-radio portion airs Friday from 7-8pm and its host Kirk Heinze was very interested in hearing more about Barber’s exploration of eco-friendly travel throughout Michigan. Last week NASA released findings indicating that 2014 was the warmest year on record, most likely due to environmental effects caused by human activity. 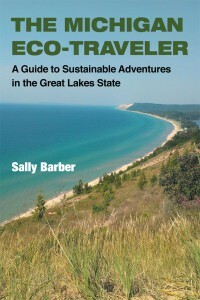 Now more than ever, books like The Michigan Eco-Traveler are necessary to help us all reduce our carbon footprint. Read about and listen to Barber’s interview here.